One of the themes of my books Beyond Thirds and Mastering Composition is that some photographers place too much importance on the rule of thirds. Good composition is about far more than the placement of the main subject. To help you improve your composition I’ve written an article that gives you five simple things to think about when composing photos. Some of these are quite deep and I think you’ll like them. 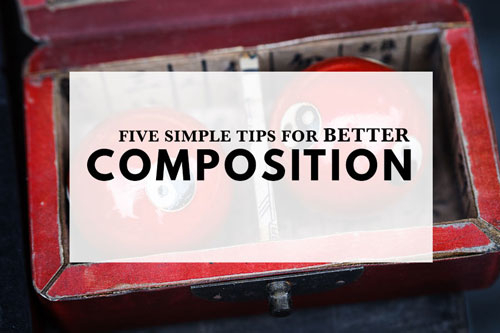 Learn more in Five Simple Tips for Better Composition. There’s still a little over 24 hours (depending on when you read this!) to take advantage of the discount on the Contrastly Complete Lightroom Presets bundle. This bundle comes highly recommended with over 1100 presets for retouching portraits, converting to black and white, enhancing landscapes and more. Last week I asked whether Lightroom is slow for you. A big thanks to everybody who replied, I found your comments very interesting. As expected there were a range of responses. It seems most of you are happy with Lightroom’s speed, but there are some areas where you think it could be improved. The most common cause of complaint is Lightroom’s speed on older computers, and the length of time it takes to back up the Catalog. Here is a selection of the most interesting replies (edited for brevity). John: In response to your question about Lightroom speed, I have to say I have seen it get progressively worse over the last couple of years. I run Lightroom on a mid 2011 iMac with an i7 processor and 32 Gb of RAM. At first I noticed it slowing down when closing, as I was doing a back up every time as well as testing integrity. I have now been forced to back up without doing either of the additional tasks/checks on closedown. There is a slight lag in processing files in that I no longer get instant results when moving the sliders and have to be aware of the slight delay in response times when processing my images. Lightroom tells me my graphics card is too old to be used for acceleration. Finally, I am now finding that Lightroom startups are taking much longer. David: I’ve never had an issue with Lightroom’s speed. I will qualify my answer by saying that I have a near new laptop that was built to handle programs that need a lot of power. Even more important is the amount of RAM. Since RAM (and processor speed) are expensive, many try to cut costs, which is the wrong thing to do when working with photos using any top of the line software. Tony: I wouldn’t claim more than modest expertise in using Lightroom but it does seem that in their rush to pillory the software many of its detractors seem to forget the role of the system. Whilst Adobe cannot be held to account for the inadequacy of users’ hardware, there does seem to be scope for speed enhancements. Since, this has been the case for several years now, the company can justly be criticized for its slow response and complacency. Adobe’s recent invitation to let them know how they can help us, could be seen as a belated response to combat newcomers such as Luminar, Affinity, and others sniping at their heels. It seems that Adobe has been stirred into action and those elements of Lightroom that can be improved are destined for a makeover. Let’s hope that this doesn’t mean a price hike or an end to the standalone version. Paul: I’m happy with everything except Lightroom’s backup mode. It seems like backups take forever, with about 600GB in the Lightroom folders. Other than the backups, Lightroom’s speed is quite satisfactory. I don’t use presets and I don’t do any bulk processing. Note: My article How to Make Lightroom Run Faster explains how to set up Lightroom to run most efficiently. Here is this week’s Q&A. Keep the questions coming – I love reading them and answer every one. Just reply to this email to send me your questions. James: I just tried to upgrade to the latest version of Lightroom CC (2015.12), but the Creative Cloud app says that Lightroom is up to date even though going to About Adobe Lightroom Photoshop CC shows that I only have 2015.8 installed. Can you help? Andrew: This is a bug with the Creative Cloud app. The same thing happened to me with the latest update. Adobe has a help page with a number of suggestions to try in order. I worked through them all and none of them worked for me except the last. I had to uninstall Lightroom (which you can do safely without losing your Catalog or your Develop Presets, although you may want to back both of those up to make sure). Then I reinstalled Lightroom, which put the very first version of Lightroom CC on my machine (2015.0!) Then I was able to use the Update button in the Creative Cloud app, which worked this time, to update to the latest version. This is the link to the help page. This is the link to the instructions for uninstalling then reinstalling Lightroom. Lucia: I have all my Lightroom files on an external drive. How do I move the Catalog to an internal drive? I’m not enough of a techie to know how to move just the catalog; I am terrified of losing everything. And if I were to destroy my computer accidentally (which I did a month ago), would I lose the Catalog? Andrew: It’s quite simple to move the Lightroom Catalog to your internal hard drive. All you have to do is copy the folder that contains the Lightroom Catalog and all the preview files to a folder on your internal hard drive. The key is to copy it – that way the original files stay on your external hard drive as a kind of back up. My preferred way of working is to keep the Lightroom Catalog and preview files on the internal hard drive for speed, and Raw files and photos on an external drive because they take up so much storage space. I set Lightroom to save a backup of the Catalog on the same external hard drive as my photos every time I close it down. The key thing in your case is to make sure that you have a backup of your Lightroom Catalog on a different hard drive to the one it is saved on now. Moving the Lightroom folder to your internal drive is probably the easiest way to achieve this. If you’re not confident with moving files around then maybe you can find somebody who knows their way around a computer to help you. You’ll gain confidence when you see how easy it is.